The Life I Read: "...for keeps..."
I hosted two dinner parties last week: an evening party with a group of friends who have gathered monthly for what must be at least a quarter century and a ladies luncheon in honor of David's mother's birthday. 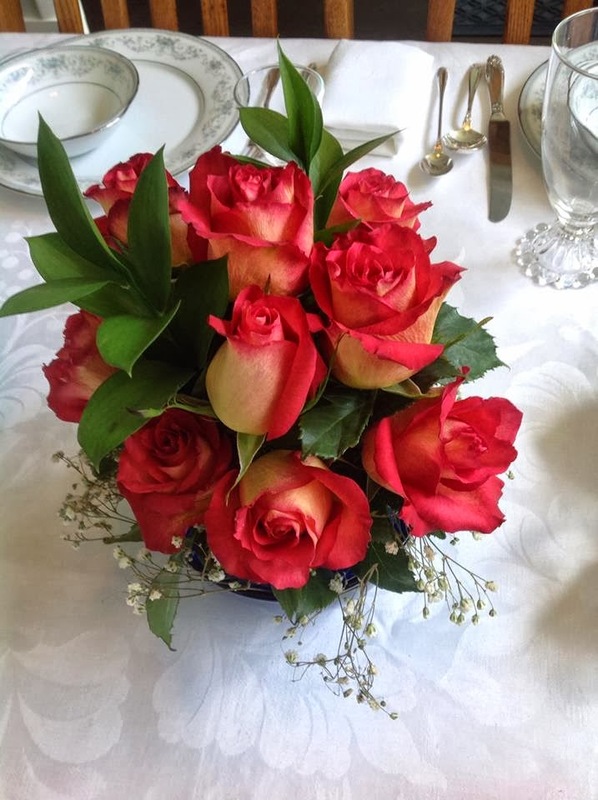 As we walked Betty to her car, I bemoaned the fact that I had once again failed to snap any photos of the event other than those I took of my table before the guests arrived. Betty replied, "Well, at least you got the most important shot." She was perhaps being a bit sarcastic. Or not. 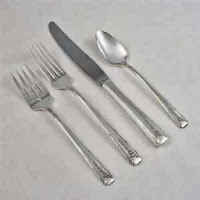 She is an old school lady of the South and understands about silverware. I'll comfort myself with the thought that perhaps I'm just so entirely "in the moment" that I don't think of preserving the history. I do not much like to have my own photo taken so perhaps I'm being a considerate hostess. Yeah, let's go with that until I have serving staff--a butler, a footman, and a maid in a crisp white apron. Oh, yes! I do love the dining room in Downton Abbey. David will tell you that he once had to drag me out of shop in New Orleans that had a beautifully set dining table to seat twenty-four. "Nothing succeeds like excess." 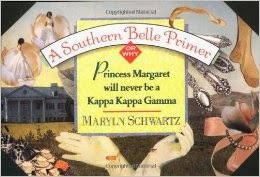 I particularly enjoy "Chapter Four: Silver Patterns" in Schwartz's book, p. 41 which describes Betty's "Rosepoint. Wallace International. Old-fashioned girls pick this pattern." It's my secret favorite sterling pattern. I might have chosen Rosepoint if I hadn't picked my silver pattern before I started to first grade. 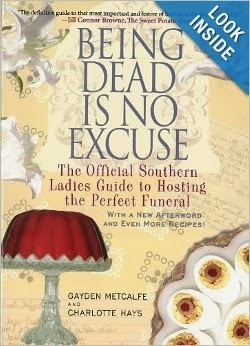 From the opening paragraph of Being Dead: "Polishing silver is the Southern lady's version of grief therapy. [They] have a thing about polishing silver.... Maybe it has something to do with an atavistic memory of defending our silver from the Yankees, but it does ensure that the silver will be sparkling for the reception, which almost always follows a funeral." 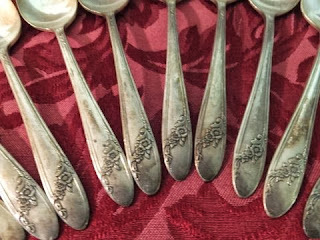 My love for silverware predates my learning to read. Stacked under a table in the my grandparents' bedroom were magazines, mostly dating from WWII through the very early 1950s, which pre-school me leafed through. Since I could only read a few words, I was mostly looking at advertisements and making up stories about the pictures. My favorites were the Community silverware ads. "You hear his special footsteps (glory be that's your heart pounding). You see his special smile (he's been saving it for you). Your head finds its home-place on his very special shoulder. It's true--praise be--it's true--he's home for keeps...."
These ads were really very short romance novels, popular pin-ups for "the girl he left behind," and undoubtedly foundational to the weaving the American dream. 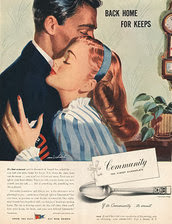 The illustrator/artist for these ads was Jon Whitcomb 1906 - 1988. 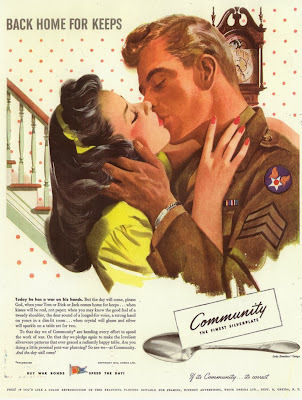 The words "back home for keeps" were easy to read and some of the first I learned but I loved this ad with its dark-haired beauty and her sergeant in an army uniform because it reminded me of my parents' love story. 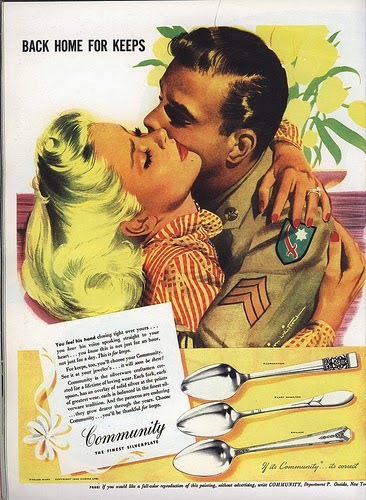 Their courtship spanned his enlistment in the Army Air Corps and they married in 1947. At the end of each date she would say, "Gimme your dimes." He'd pull the change from his pocket and pick out the dimes, adding them to those she had collected. They were saving to buy their silver. 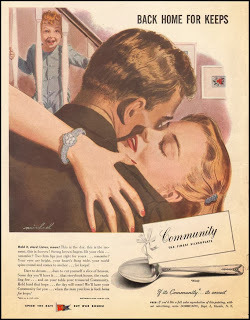 They bought Milady which is the pattern near the bottom of the ad and was frequently featured in Community advertisements. 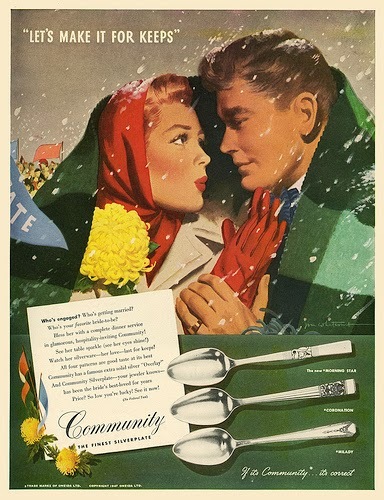 I grew up using this silver--yes, every day. 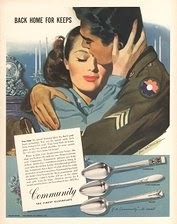 I still have a spoon from the original service. For my parents' 60th wedding anniversary I shopped eBay and bought them a almost-good-as-new service. Mostly as "show and tell" for their grandchildren. 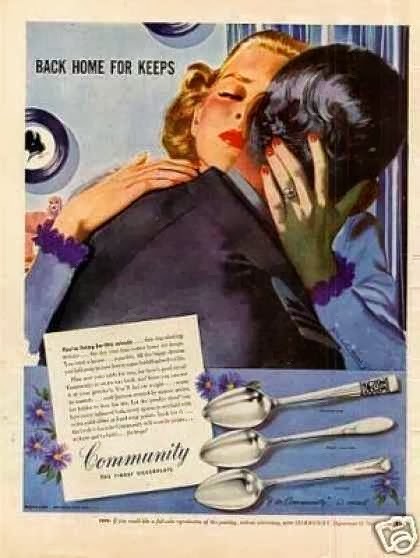 I also collected several pieces and make frequent use of the iced tea spoons, the soup spoons, the butter spreaders which are great for soft cheeses, and a few forks when my entertaining ambitions exceed my sterling. 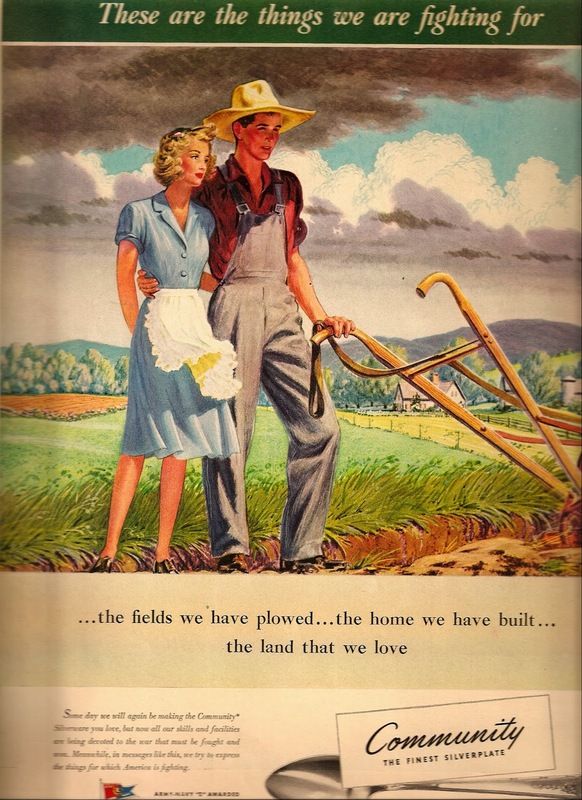 Milady was one of the first few patterns to come back into production following WWII. 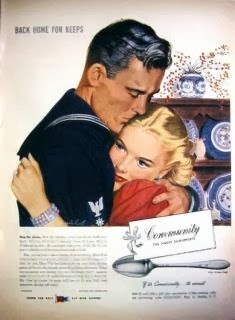 Whether a bride selected silverplate or sterling, most got promises until several years after the war. Oneida Ltd. (Yes! Oneida Community) manufactured this high quality silverplate and continued to advertise it through the war years but the plants had been retooled to make surgical instruments, combat knives, ammo clips, and shell casings, for the war effort as they had done during WWI. The company had emerged from the Great Depression as the only profitable silverware manufacturer and would lead the way in the 1960s to the move to stainless steel flatware for home use. 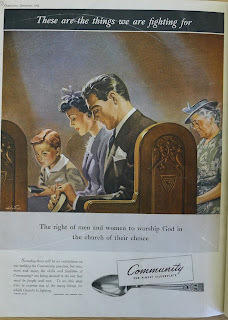 Community/Oneida had other ad campaigns. 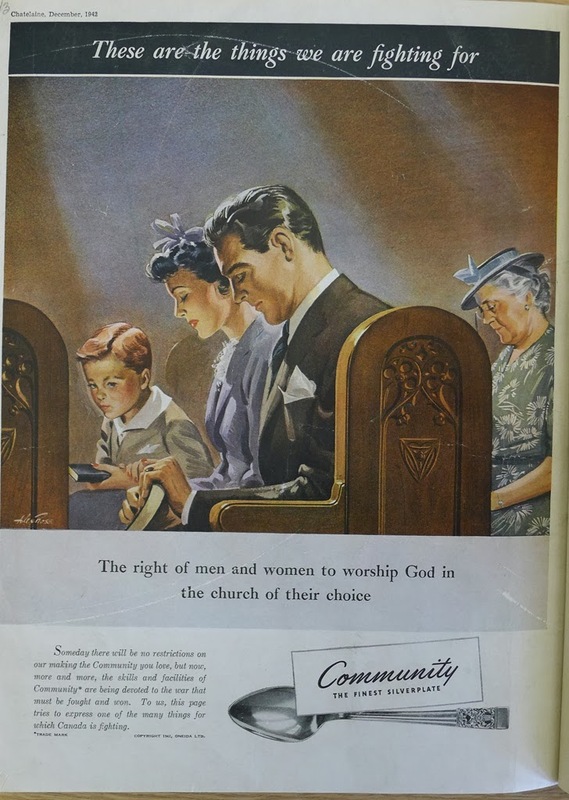 "These are the things we are fighting for" was much like the more famous "Four Freedoms" series by Norman Rockwell. The "Back Home for Keeps" series would give way to the post-war "Let's Make It for Keeps" which was also a favorite of mine. 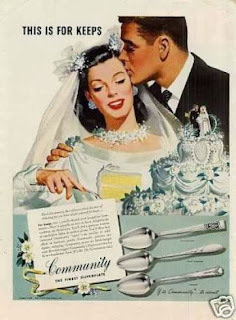 "The Happiest Brides have Community" is undoubtedly a true statement and it's great advertising but I was not too fond of that series; most of the illustrations were of a bride only. Somehow I always thought the guy was more important than the wedding or even the silverware. Christmas advertisements frequently pictured multiple generations. The bride's mother and grandmother might also be dreaming of setting her table with Community silverplate. 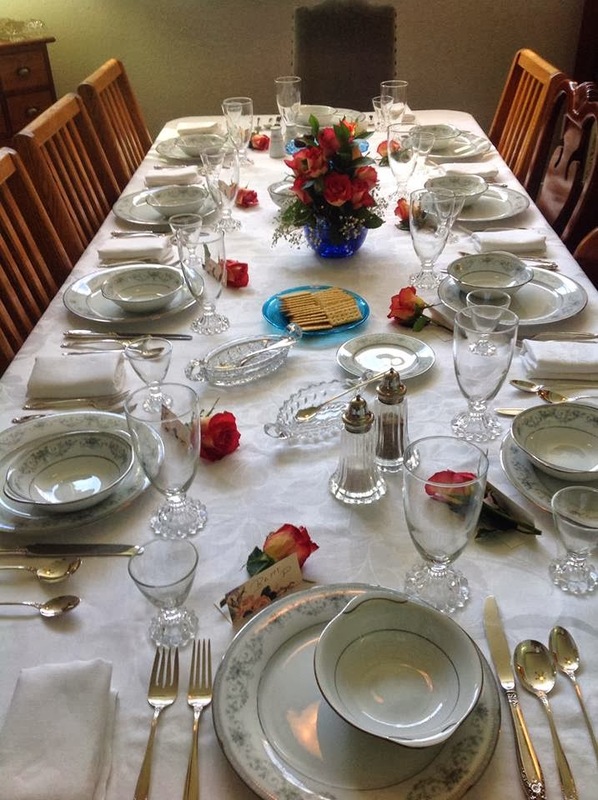 Gran Cummings set her table with Oneida's Vernon silverplate. I was delighted to shop for and gift my God daughter with her grandmother's Community silver. The pattern is Old Bess. 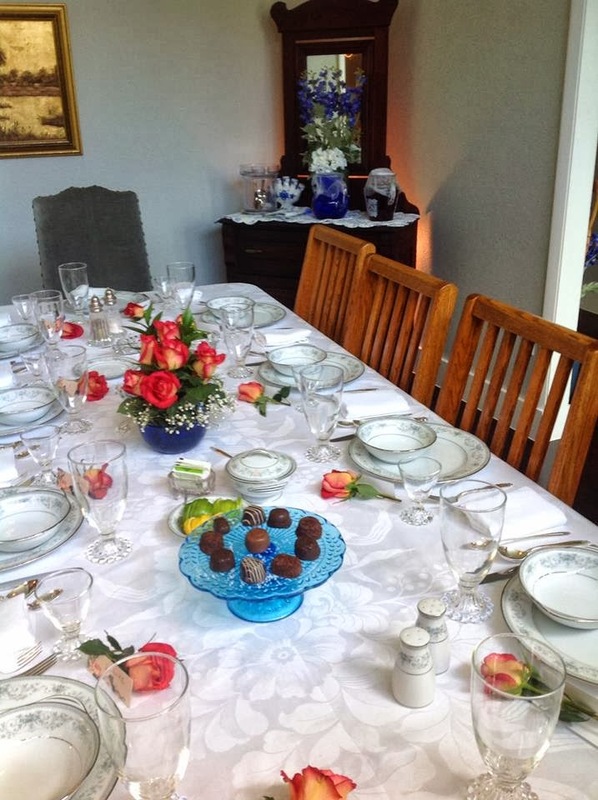 The salt and pepper shakers graced Gran Cummings's table. The turquoise plate is the first thing I bought at an antique auction. I sprinkled the pedestal tray with flor de sel because a bit of salt makes the good chocolate bloom. The words we read and the illustrations we admire help shape the people we become. I was perhaps overly influenced by those Community advertisments. 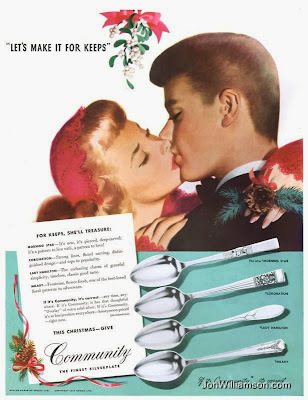 As a child, I had no idea what it meant to be married but I was absolutely sure it involved good silver. Link to more internet images. Scroll through this small gallery of my favorite "for keeps." Awesome post! Love those ads myself. And while it's not real silver, I have the flatware (complete with wooden chest) that my mom bought in Kansas City when she was one of the first women employed by TWA.